The first endeavor, which will result in a turbine-generator delivered to the site, will be completed by February 2014. The projected funding requirements are approximately $1.0 million. During the second phase, Makai will install the turbine and begin operation testing. Michael Eldred, project manager of the OTEC Test Facility, says that the technical benefits of having a turbine are huge. “Besides the obvious benefit of once again including OTEC power on the grid, it will also validate the results from our OTEC models and allow us to fine-tune our control systems,” says Eldred. The new generator would result in the world’s only operational OTEC plant since 1998 and is likely to create a steppingstone to commercial-size renewable energy supplies for Navy and DoD bases in Hawai’i and Guam. Included in the second phase effort are the development of two new OTEC-optimized heat exchangers and the continuation of corrosion testing, now in its fourth year. Due to their enormous size, heat exchangers are one of the most expensive components in an OTEC power plant. A small increase in efficiency therefore dramatically drives down cost. Makai’s focus is to optimize the heat exchanger design by reducing material and fabrication costs, improving thermal efficiency and maximizing its life in the corrosive seawater environment. An estimated $3.6 million is slated for the project. Over the past three years, Makai Ocean Engineering, Inc. has received Office of Naval Research (ONR) funding to conduct research in key areas of OTEC heat exchanger development at the OTEC Test Facility site at the Natural Energy Laboratory of Hawai’i Authority (NELHA). The overall goal is to determine a baseline heat exchanger design for a future large-scale OTEC power plant useful for both US Navy and commercial application. The stated goal of the Navy Energy Vision is that half of the Navy’s total energy consumption ashore will come from alternative sources by 2020. At present, the Navy is approximately 700 megawatts short of meeting this goal. OTEC is a technically and economically plausible way for private industry to furnish 200-300 megawatts of baseload, renewable electricity to USN and USMC bases for Oahu and Guam. Robbie Alm, executive vice president of Hawaiian Electric Company, has called OTEC a “gamechanger” because it is 24/7 renewable power. Demonstration of OTEC-generated electric power will help spur commercially-funded technology development needed for large scale expansion. 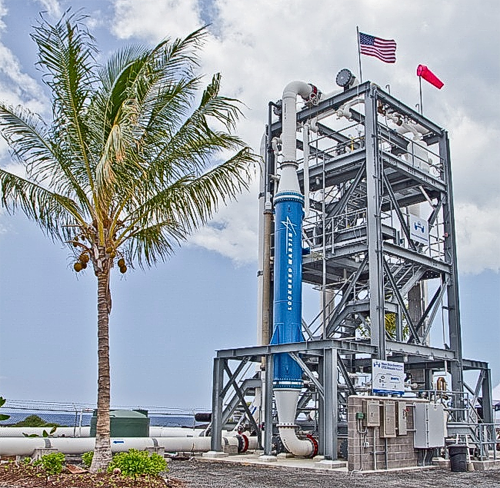 Lockheed Martin Corporation is developing OTEC heat exchangers and cold water pipes, with the ultimate goal of large scale commercialization. OTEC is a process that can produce electricity by using the temperature difference between deep cold ocean water and warm tropical surface waters. OTEC plants pump large quantities of deep cold seawater and surface seawater to run a power cycle and produce electricity. OTEC is firm power (24/7), a clean energy source, environmentally sustainable, and does not compete for precious resources like land or fresh water. Makai Ocean Engineering was founded in 1973 as a diversified ocean engineering company focused on providing design engineering and development services to a broad range of clientele both foreign and domestic. Practice areas include engineering for ocean-based renewable energy (OTEC and Sea Water Air Conditioning), large underwater pipelines, software for planning, simulation, installation and recovery of submarine cables and arrays, and software for visualizing scientific 4D/5D data. Makai Ocean Engineering takes pride in successfully achieving innovative solutions to difficult problems for its partners and clients which has included private, industrial, and commercial firms nationally and internationally; federal, state and local governments and Pacific Island Nations.